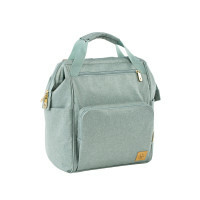 The sustainable globetrotter Green Label Goldie Backpack bouclé beige delights mothers on their outings, with its large range of accessories and particularly modern features. 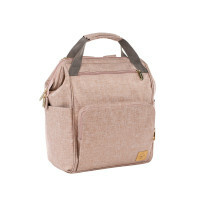 Product information "Goldie Diaper Backpack, Bouclé beige"
description & equipment The Green Label Goldie Backpack is a real globetrotter that combines functionality and sustainability with modern highlights, in a brilliant way. 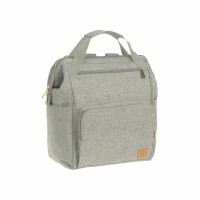 The backpack’s outer material is 89% recycled polyester Cyclepet® which is made from recycled plastic bottles. The extensive range of accessories also delights families, who like to go on outings with their children, in style and well-equipped. 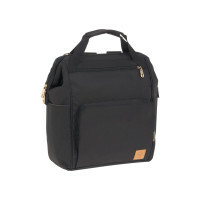 The medical bag clasp and a clear division of compartments inside, enable you to have everything at your finger tips. Spacious compartments and accessories such as water-repellent baby changing mat, insulated, removable bottle holder, removable glass food jar holder, integrated cell phone pocket, key finder and much more, make the Goldie Backpack to a true organizer and a spacious holdall. 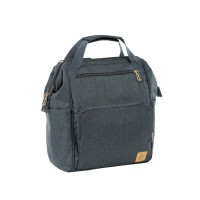 In less than no time, the backpack can be turned into a shoulder bag by means of the extra shoulder strap. The backpack straps and stroller hooks can be easily stored away in the back pocket, when necessary. Thanks to the stroller hooks, it can also be taken off your shoulder and directly attached to a stroller or bicycle trailer. This both protects your back and is practical.